MSI has published a Radeon HD 7900 series info kit that includes launch dates of the other Radeon HD 7000 series cards. If AMD doesn't change its launch dates, the Radeon HD 7700 cards should arrive on February 15th while the Radeon HD 7800 cards are slated for March. The launch date of the 7990 is still unknown. 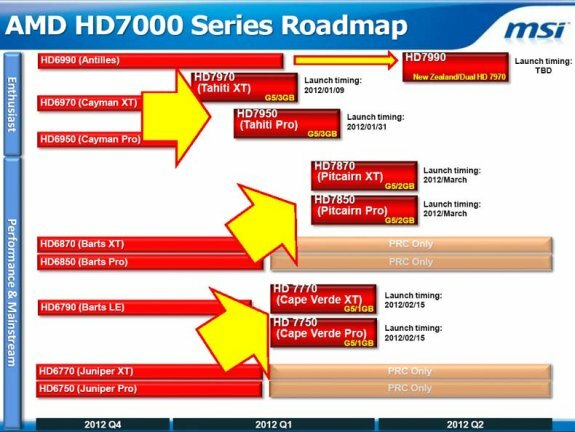 According to the roadmap, HD7750 and HD7770 will be available on February 15. Both cards will have 1 GB of GDDR5 memory, and from previous reports we also know that the boards will have 900 MHz core frequency, 896 and 832 stream processors, and 56 and 52 texture units. The HD 7770 will be priced at $149, and HD 7750 will be $10 cheaper. In March AMD will release HD 7850 and HD 7870 GPUs, both featuring 2 GB of RAM. The 78x0 series will have core and memory frequencies, comparable to 77x0 series, however they will pack from 1280 (HD 7850) to 1408 (HD 7870) stream processors, and from 80 to 88 texture units. HD7870 will retail for $299, and HD7850 will be $249. The roadmap doesn't have launch date for HD 7990 card. Based on older reports, this dual-GPU card may launch in March 2012, and it will cost $849. And AMD leaves Nvidia in the DUST for 2012... Nvidia won't issue half their next generation till the middle till latter half of 2012, so it seems likely the year will be "red".